Swindon Advertiser today ran an article regarding government changes to planning rules and their impact on planning applications for Wind Turbines etc, including feedback from local campagin group, Ill Wind. WIND turbine campaigners in Swindon have welcomed Government plans to give more powers to communities to block onshore wind farms. But they still want to see a minimum separation distance between homes and turbines. The Government announced yesterday that planning guidance in England would be changed to ensure local opposition could override national energy targets. But the measures will see a five-fold rise in the benefits paid by developers to communities hosting wind farms. Campaign group Ill Wind, which successfully battled plans for wind turbines at the Honda plant, at South Marston, say the new guidance was a step in the right direction but should also include the minimum separation distance. The Government said the measures would ensure local communities had a greater stake in the planning process. It said it expected the energy industry to improve its community benefit packages by the end of the year. The subsidies – worth about £100,000 a year from a medium-sized farm – could be used to reduce energy bills or pay for energy efficiencies in the host community or fund other local initiatives. Energy secretary Edward Davey said: “It is important that onshore wind is developed in a way that is truly sustainable – economically, environmentally and socially. Today’s announcement will ensure communities see the windfall from hosting developments near to them, not just the wind farm”. Des Fitzpatrick, the chairman of Ill Wind, said: “We have yet to review the details of the Government’s proposals but my initial reaction is approval of a greater say for local communities in the planning process. Certainly the battle of the residents of Stratton and South Marston could have been easier if this approach had been in place when Ill Wind was set up to oppose the building of a wind farm in our community. “However, I am concerned about the economic incentives to accept wind farms locally. We opposed the building of three 120 metre high turbines because they would be a noisy eyesore and selling out the quality of the environment for a few hundred pounds would never be part of our agenda. Planning approvals for wind farms in England have dropped in recent years, a situation the Government is keen to turn around. In 2008, about 70 per cent of applications were approved, but approvals were down to 35 per cent in 2012. Ill Wind – Do you live in a wind turbine area of search? The image below is an illustration of a map which appeared in Swindon Borough Council’s “Draft Core Strategy”. It shows, in red, “areas of search” appropriate for large scale wind turbine development within the Borough. This document has been revised and is now called the “Draft Local Plan”. The map has been removed, but the commitment to large scale wind turbine development remains. Local residents successfully opposed a Planning Application to build 3, 120m high wind turbines in Swindon that would have been less than 300 metres from the nearest house, with 5000 homes and families within 2km of the turbines. They did this because of the effects on the health and wellbeing of residents and the visual impact on the landscape. 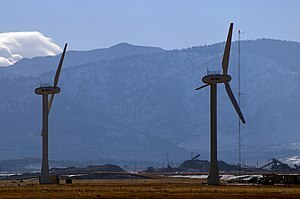 Effects that, in some cases, have been so extreme as to drive people living near wind turbines to sell their homes at reduced value and move away. Ill Wind wants to avoid residents having to fight that same battle again and again as developers apply to build turbines in different sites across the borough knowing that once one site is approved the floodgates will open. Although the Draft Plan says “Large scale wind-turbines (individual or collectively) are unlikely to be supported in close proximity to residential properties”, without a definition of “close proximity” we are at the mercy of the whims of SBC’s Planning Department. The same Planning Department that previously ignored all evidence presented by local residents and independent experts and recommended that three, 120m high turbines be built just 278m away from Swindon homes. Ill Wind, many Parish Councils and well over 800 individuals asked for the new Core Strategy to include a minimum, typically 2km, separation distance clause – but it hasn’t appeared in the revised version. Other Councils have done it – so why not Swindon? There is a 9 week public consultation from Thursday 20th December 2012 until 6pm on Thursday 21st February 2013. You can read information about the Draft Swindon Borough Local Plan 2026, and also the ways in which comments can be made at:http://www.swindon.gov.uk/localplan Page 116 onwards of Swindon Borough Local Plan – Pre Submission are relevant. Click Here for options on e-mailing the Council about the Local Plan. Renewable energy has its place in planning for Britain’s future energy needs but do you want a wind farm right on your doorstep? Proposed changes to Swindon Borough Councils Core Strategy and Development Management Policies mean that safeguards and protections in the old plan which recently helped to prevent Ecotricity from building three gigantic 120m wind turbines on the doorstep of South Marston have been swept away in favour of a blanket declaration that renewable energy projects such as wind energy should be encouraged. Worse still, the new plan designates specific areas that are Wind Turbine Areas of Search that the revised plan identifies for active consideration and Highworth, Hannington, South Marston and the eastern villages of Wanborough and Liddington are right there on the front line. A map included in the new Core Strategy shows a broad area of land just to the north of Highworth for example, where development of wind farms is considered suitable and desirable. Last year a concerted campaign saw thousands of Swindon residents voice their concerns about the revised plan in the consultation exercise that SBC initiated and well over 800 people from this side of Swindon specifically wrote in to ask for just one simple protection to be included in the Core Strategy. That there should be a 2km gap between any proposed wind turbines and residential housing. Nothing radical here, it’s been adopted by other Councils and is under debate in Parliament for a national planning restriction. But unfortunately, despite the unprecedented response to the Core Strategy consultation, Swindon Council has to date ignored residents’ requests. Honda, to its great credit, eventually recognised that their proposed wind turbines were not suitable so close to residential housing and opted instead for a Solar Farm on the edge of South Marston. However, if the same case had to be argued again, Highworth, or any other parishes, wouldn’t have the same protection to make sure the correct decision is reached. We need to make sure that our elected Councillors are aware of the genuine concerns and get this one simple, 2km rule included, or the whole public consultation process will be seen to be a sham! Contact your Councillors and your MP to make sure they are aware of your concerns. And you need to do it now, because the consultation period is coming to an end. The town’s second biggest employer has said bosses are disappointed after the council took the decision to reject their green plans. On Thursday night, Swindon Council’s planning committee rejected Honda’s plans to put up three large wind turbines on its South Marston site.